FEATURES: Compound amino acid has regulatory function which is beneficial for nutrients accumulation and balance for plants to improve growth vigor and anti-stress capability. 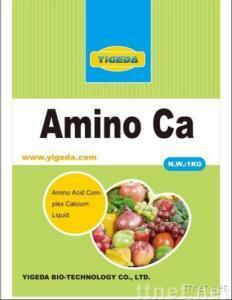 Rapidly correct calcium deficiency and prevent various physiological disorders from calcium deficiency. Enhance firmness and prolong shelf-life of most fruits and vegetables. RECOMMENDING APPLICATIONS Foliar Spray: Dilute to 1∶500-800; Spray 2-3 times within 2-6 weeks after flowering for fruit trees and at vegetative stage for vegetables. Precaution: Applications for tea, tobacco, potato, orange and tangerine are prohibited. Odour: Amino acid-like Appearance: Light Yellow liquid STORAGE: Amino-Ca should be stored out of direct sunlight and preferably in a dry and cool place under frost-free condition.